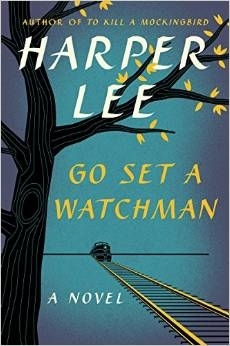 Go Set A Watchman-Are You Going To Read It? The much talked about, much anticipated prequel to To Kill A Mockingbird is set to be released tomorrow and there is already a whole lot of talk out there. I have not read the first chapter, but I have heard that Watchman portrays our beloved Atticus Finch in a less than flattering light. This comes on top of the debate over whether author Harper Lee really wanted Watchman to ever be published, or if she has been manipulated by lawyers/publisher just to make $$. So, I am asking everyone out there- what are your thoughts here? Will everyone read it? I agree about her being manipulated by her lawyer. There was an article I read that someone had found the manuscript three years before and Lee’s attorney had been present at that meeting going through Lee’s papers but claims she “stepped out” for a moment when the manuscript was actually discovered and never heard of it. I am interested to read it, if only to form my own opinions of the story. In my opinion, I would agree that Lee might not have wanted it published and held on to it, and now her attorney having it published under these very odd circumstances to promote its sale. But that’s just my opinion. I will definitely read it. Even if it’s only half as good as To Kill A Mockingbird, it will be worth reading. I am eagerly awaiting my turn for it from the library but I’m number 87 on the holds list so it’s going to be a while! It’s sad that the possibility of Harper Lee being manipulated exists at all, but it’s there. She wouldn’t be the first author to have her work published without explicit and informed consent, and I bet she won’t be the last. It’s so sad. I know I will end up reading it, but I think I’ll wait for the hype to die down. That way I’ll know what I’m getting into and my expectations won’t smother the reading experience. Nope. It should have stayed “lost”. I will wait until things calm down and I’ve read a few reviews. To Kill a Mockingbird is such a classic, I would hate to read something that dilutes or negates that book. As a writer, I understand Harper Lee’s life-long desire to not publish a draft of the book that ultimately became To Kill a Mockingbird. Writers pen all sorts of things to arrive at the story they want to tell, and those things aren’t for general reading/consumption. I’m firmly in the camp that has her being manipulated by her attorney. The woman has even come forward now claiming to have found a third book. I know- it just sits wrong with me. I actually have the book- not sure when I am going to read it though. Its all very sad. I’m definitely going to read it, but I too, feel quite uncomfortable with the ‘unearthing process’. It feels quite dodgy, and considering it was written well before the original, she probably didn’t feel like it was something she wanted to publish. I agree- still haven’t picked it up.